Expand your marketing communications beyond email. With ClickDimensions SMS messaging, send text messages to your leads and contacts. Text messages can be sent in bulk or from Microsoft Dynamics CRM workflow. 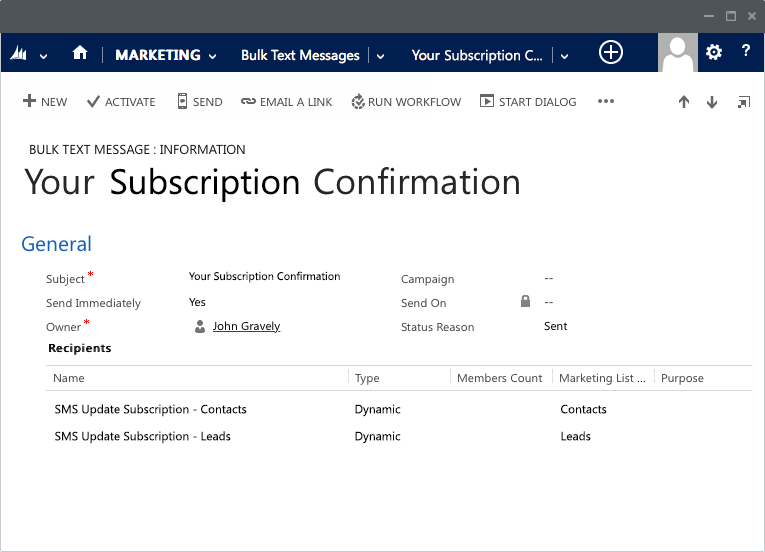 Through ClickDimensions’ integrations with Twilio, MessageNet and BulkSMS, you can send SMS (text) messages in bulk to Microsoft CRM marketing lists. The messages are sent to the mobile numbers of the lead and/or contact records on the marketing lists. CRM activity records are created to document that the message was sent. You can even personalize your text messages using data stored in CRM. Trigger SMS messages from CRM workflow and merge lead or contact data into the message contents. A personalized message is sent to recipients and logged in CRM as a closed activity associated to the lead and contact records.